Dongdo, Seodo의 형태로 표기하며, 필요시 Dongdo(East Island), Seodo(West Island) 형태로의 병기를 허용함. ※틀린 표기의 예) East Island and West Island comprise Dokdo. Dokdo is comprised of East Island(Dongdo) and West Island(Seodo). - 항상 단수인 "island"만을 사용함. - "islet"나 "rock"은 사용하지 않음. 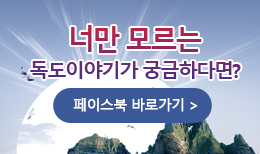 ※옳은 표기의 예) Dokdo, a beautiful island of Korea. Dokdo is comprised of Dongdo(East Island) and Seodo(West Island). ※틀린 표기의 예) Dokdo, Korea's easternmost islands. Dokdo is a Korean islet. Dokdo is a lonely rock. Dongdo(East Islet) and Seodo(West Islet) comprise Dokdo.